A Hybrid Exhibit is an exhibit that incorporates both custom and modular trade show display components for rental or purchase. The hybrid uses modular systems where they are most beneficial and pairs them with custom built components where modular systems can’t be used or simply do not benefit the design or budget. What are the benefits of Hybrid Exhibits? 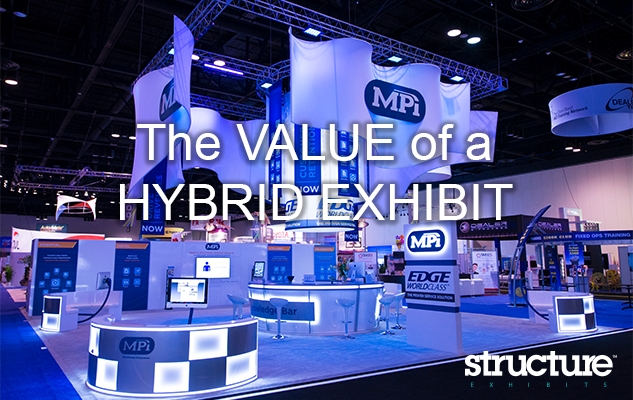 There are many benefits of Hybrid Exhibits. Here are a few. Sometimes the design of your new exhibit is outside of your budget. An alternative to a full purchase is to mix it with rental components. You can also take a rental exhibit and purchase custom components to dress it up to make it your own. You would be surprised to know that many exhibits you see on the show floor are rentals. Hybrid Exhibits allow for better design, especially when pairing up a modular exhibit with custom components. Modular exhibit designs are limited to the pre-manufactured parts and often times where a custom part is needed a modular part might be substituted which may not be right for the design or simply shouldn’t be used because of stability issues or other factors. Better Quality & the Right fit. Because modular exhibits are light weight they can also be unstable. Do you want your whole conference room to shake while you are in the middle of an important meeting because your team opened and closed the closet door on the backside of that room? Using the right components for the job makes all the difference. Modular Exhibits are great for many things. They can break down into smaller pieces which in turn allows them to fit in smaller crates. This saves on shipping costs. However, custom built components have their own benefits too. What many exhibitors don’t realize (and quite frankly are not told) is that it usually takes longer to install a modular exhibit than it does to install a custom one. More parts equal more time and one of the largest costs of exhibiting is show floor labor. Custom built exhibits come out their crate already built (for the most part) and are set into place. Smaller parts can go missing fairly easy in the chaos of the close and dismantle of a show and they also take longer to pack up. Why should I choose a rental Hybrid Exhibit over a rental Modular Exhibit? The best reason to choose a Hybrid is to avoid being a COOKIE CUTTER booth. Have you ever been out on a show floor and walked into a sea of exhibits that all look the same? It happens more often than you think. There are many trade show companies across the country that sell the same exact rental packages right off of their websites. Sure they are quick and simple, sometimes cheaper too, but you end up looking like the 30 other exhibits on the show floor and quite often you will see a neighboring booth that is vastly similar or even exactly the same just with different graphics. Isn’t the point of exhibiting to STAND OUT FROM THE CROWD and differentiate yourself from your competitors? Don’t fall into the modular exhibit “packaged price” trap. Make sure if you choose a modular exhibit rental that you define it with custom components, so you can STAND OUT. Get the best of both worlds on your next rental or purchase and ask for The Hybrid Exhibit.